Nebraska football coach Scott Frost isn't ready to name a starting quarterback for the Cornhuskers yet. In fact, he's not even ready to rule out the prospect of playing two quarterbacks in the opener against Akron in 15 days. Though that wouldn't be his preference. "I was a quarterback and if you would've taken me off the field for half the series I wouldn't have felt comfortable and like I was in a rhythm," Frost said. Nebraska is down to a "two-horse race" according to Frost. He noted that sophomore walk-on Andrew Bunch has done some "great things," but redshirt freshman Tristan Gebbia and true freshman Adrian Martinez have separated themselves. "If we had to play a game today both guys deserve to play. We'll see how we manage it," Frost said. "I know even when I was in school Coach [Tom] Osborne wanted to intentionally give the next guy reps –– actual, meaningful reps –– because you're always going to need a second quarterback. The competition is still going on and we'll see where it lands at the end. I'd prefer it if it was one guy but if we need to play the other one a little bit to get him ready we will." Nebraska's top two contenders at quarterback offer slightly different skill sets. 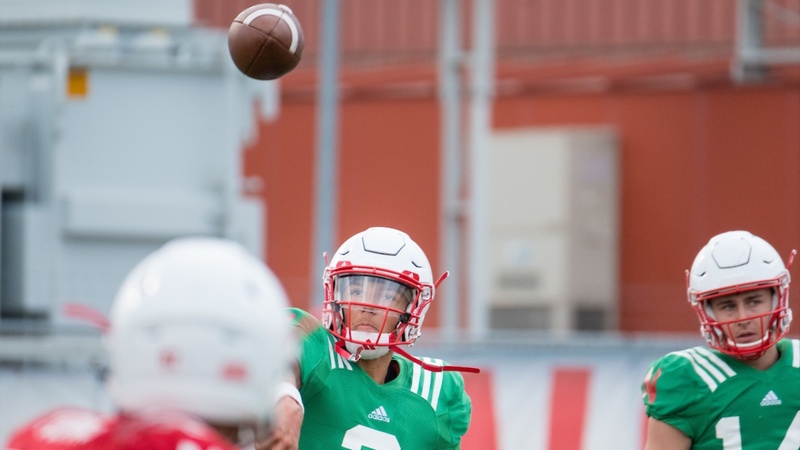 Gebbia, Frost said, has had an edge in fall camp when it comes to "accuracy, arm strength and decision-making in the passing game." While Martinez isn't exactly lacking in those areas, his edge over Gebbia is as a runner. "It really comes down to who is going to operate our offense most efficiently," Frost said. "We have enough weapons on offense, I think, that if we have a quarterback play well and efficiently and get the ball to the right guy on time we can be pretty dangerous on offense." Taking care of the ball will be another key to deciding Nebraska's quarterback derby. The Huskers held their second scrimmage of fall camp inside Memorial Stadium on Friday. It included a couple of turnovers from the quarterbacks that Frost would like to eliminate. "Adrian pry had a little better day today, but that's not always because of the quarterback," Frost said, noting that a few bad snaps may have hampered the offense's overall performance under Gebbia. How a team plays around the quarterback always influences the perception from any one practice. Nebraska's staff is remaining mindful of that during a race that remains neck-and-neck. "I thought yesterday Gebbia had a great day. Today, Adrian had a really great day," Frost said. "It's kind of been back and forth like that through camp."